Technology has made it easier than ever to reach wider audiences no matter where they are in the world. All it takes is a little thinking outside the box and you can market a self-published book in creative ways, affordably and impactfully. This is where book tours come in: Tours are a great way to connect with your readers and technology has made them easier and more cost effective than ever! Author Neil Grant is taking his latest book Rise of the Gig Leaders: Why Interim Leaders Are Vital In Today’s Organizations, on tour — a Virtual Book Tour with Outskirts Press. This will allow Neil to take his book into the far corners of the globe, all from the comfort of his own home! Keep an eye out for Neil’s book as he will be featured on several blogs over the weeks and months ahead! Luckily for us, Neil was kind enough to answer a few questions as the tour was getting started so that we can give you a sneak peek into the mind of the creator of Rise of the Gig Leaders: Why Interim Leaders Are Vital In Today’s Organizations. OP: Tell us a little bit about Rise of the Gig Leaders. What is it about? Neil: Change is constant. Organizations are facing a crisis of leading ever-increasing change projects as well as tackling day-to-day operations. Asking internal leaders to take charge of these projects is challenging — they are a finite resource. Consultancies don’t necessarily have the industry or specialist experience to tackle complex change programs. Interim leaders are senior leaders who have held senior leadership roles and who are adept at leading change. An interim leader has no interest in a permanent career with a client organization, but is focused on delivery, pace, and excellence. Gig Leaders provides a contemporary and thorough review of interim leadership with specific insight into its focus, business case, and potential. 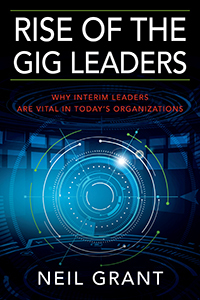 The book discusses the context of the gig economy, features testimonials from interim leaders as well as executives who have engaged interim services and provides numerous examples of interim leadership in action. A model is described which articulates interim leadership, competencies are defined which characterize how interims operate, and the distinctive value of interim leaders is featured. Neil: I have been an interim leader for 17 years. There is a real need for senior leaders to understand the potential of interim leadership as a vital component in their leadership resourcing strategy. Other books on interim leadership are showing their age, and do not provide such a comprehensive analysis of this type of leadership resource for leading change. Neil: I self-published the book through Outskirts Press. Neil: All organizational leaders (business and non-profit), HR leaders, change leaders, and interim leaders both present and aspiring. Neil: Interim leadership is set in the context of the booming gig economy. The SCILL model© of interim leadership defines the DNA of an interim leader — this gives real insight into the motivation, potential, contribution, and character of an interim leader. OP: What differentiates your book? Neil: No other book on interim leadership provides a model that defines the DNA of an interim leader. Gig Leaders incorporates feedback from executives and interim leaders to show both sides of successful relationships. The book provides practical help with the recruitment of interim leaders as well an assessment for leaders to consider their suitability for an interim leadership career. Neil: No, I have not. OP: Thanks for your time, Neil! We look forward to learning more about you as you visit other bloggers! Neil Grant is the owner of Focal Leadership LLC, specializing in global interim and consulting services in strategic leadership and organizational development. With experience in numerous industry sectors around the world, he is a leading authority on interim leadership to fuel organizational growth and transformation. He delivers critical leadership development projects for clients, as well as workshops and conference talks. Visit www.focalleadership.com or contact Neil directly, Neil@focalleadership.com.